A new analysis by the Center for Health Care Research and Policy (CHRP) has found that MetroHealth patients insured by Medicaid, i.e. low-income patients, are far less likely to use the hospital’s “MyChart” personal health record application than patients covered by commercial insurance. 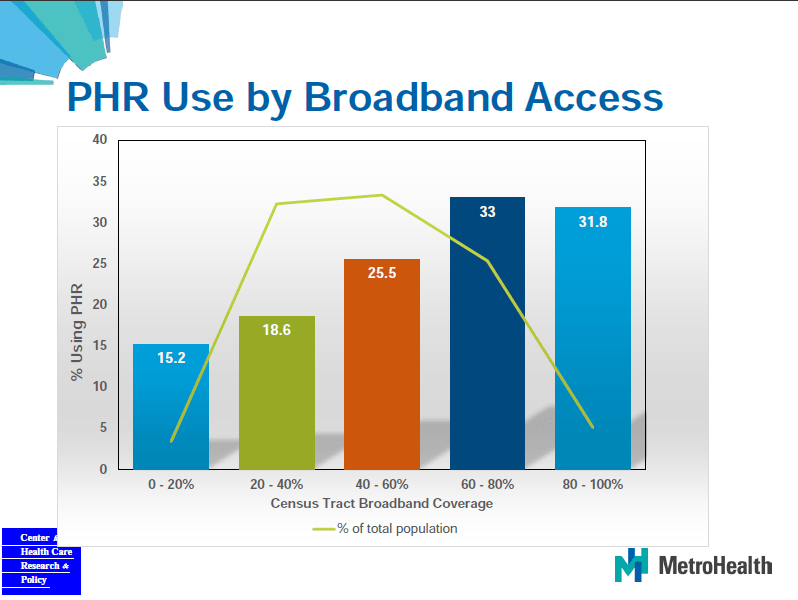 The CHRP study, which looked at more than 300,000 outpatients seen by the Cleveland-based healthcare system between 2012 and 2015, also found that patients living in Census tracts with low levels of household broadband coverage (based on FCC Form 477 data) are only half as likely to use MyChart as those living in tracts with high broadband penetration. The new analysis was unveiled by Dr. Adam Perzynski at an August conference held in Cleveland by the Society for General Internal Medicine. Perzynski is a research sociologist for CHRP, which is sponsored by MetroHealth and Case Western Reserve University. View or download a complete copy of Perzynski’s SGIM presentation. MyChart is an online “personal health record” (PHR) service licensed to MetroHealth by EPIC Systems and offered free of charge to all of the system’s patients. It provides access to test results and other record information, online appointment scheduling, prescription renewal, patient self-education resources from trustworthy sources, and email communication with doctors and nurses. MetroHealth has offered MyChart since 2011 and strongly encourages patients to make use of it. The CHRP analysis, which may be the first of its kind, suggests that MetroHealth’s efforts to spur MyChart adoption are being seriously hampered by the fact that three-fifths of Cleveland’s low-income households lack any kind of Internet access. MetroHealth, Cuyahoga County’s major “safety net” healthcare provider, has a large proportion of Medicaid households in its patient population. 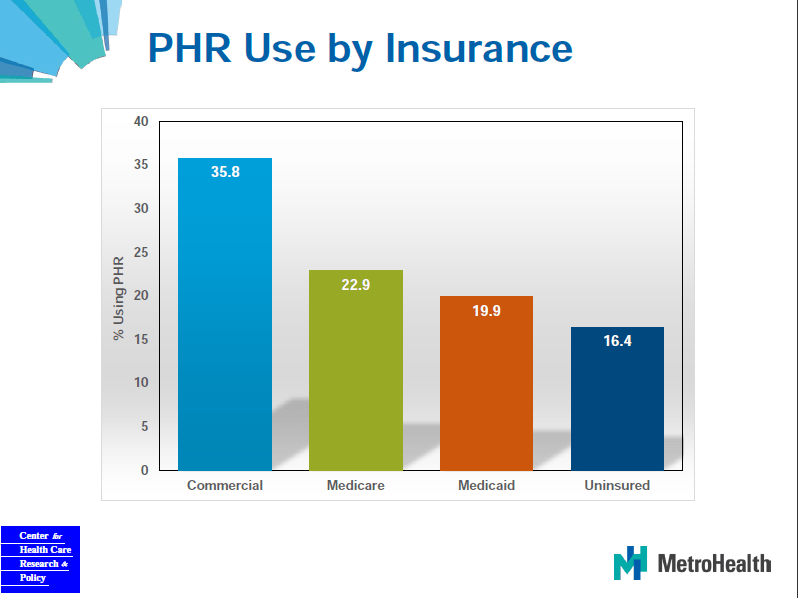 Of the 304,000 outpatients seen during the 2012-15 period covered by the CHRP analysis, about 47% were insured by Medicaid and another 11% had no insurance. 1) Only 20% of Medicaid patients and just 16% of uninsured patients had logged into MyChart accounts, compared to 36% of patients with commercial insurance. In contrast, the MyChart user percentage was 32-33% for patients living in Census tracts where FCC data says more than 60% of households have broadband. MetroHealth can already see Cleveland’s economic digital divide reflected in our MyChart user data… There is good reason for concern that this disparity may widen, as continuing efforts to add MyChart users run up against the limited supply of lower-income patients who are actually able to respond.